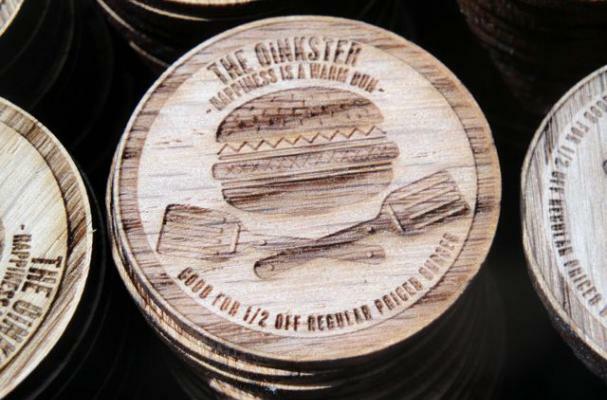 Most restaurants run paper or mobile coupons, but the Oinkster restaurant in Eagle Rock, Calif. commissioned 2ndWnd for a series of laser-cut wooden burger nickels. The reusable burger nickels entitle the bearer to a 50 percent discount on a regularly priced burger at Oinkster. Oinkster bills itself as "slow fast food," with menu items that include a barbecued pulled pork sandwich, house-cured pastrami and 1/3-pound hamburgers and cheeseburgers. What do you think of the restaurant's reusable burger nickels?